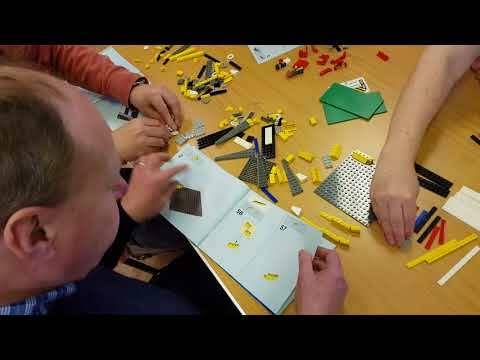 The longest-running (and only UK-wide) UK LUG is Brickish, which is holding its annual members' weekend and AGM this weekend. There are a number of silly games and fun challenges which take place during the weekend, and one of the activities is a speed build. There was, however, a twist to the speed build this year, which participants weren't told about beforehand. The set used was #60119 Ferry. This set has three instruction books - one (glued) for the car and two (stapled) for the ferry. The twist was that beforehand, each box had been opened, and the stapled books had been taken apart and reassembled in a different order - including swapping pages between books. The boxes were then resealed. Here's a video of the first five minutes. You may be able to spot our very own @Huw at one point, looking rather bemused! So funny! Loved @Huw's reaction. Can't help but wondering if the step numbers would have been a bit of a giveaway though. Oh they were a complete giveaway! It's funny though, that it took some a little while to twig! I spy Mike from 3Brickfriends as well. Looks like a giggle! Nice prank. At least they didn't mix up alternate builds from a 3-in-1. Given how long it apparently took them to catch on, I think we can conclude that most people ignore the step numbers and just look at the pictures. Nice! :D Whose team won? The team on the right as the video starts. I think they were the first to effectively abandon the instructions and just build from images of it at various stages of completion. Huw's team came second. The last-placed team soldiered on with following the instructions, and finished way, way after the first two teams!